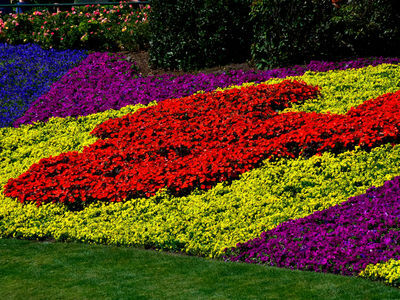 It's that time of year again when Epcot comes into all its glory with the International Flower & Garden Festival. 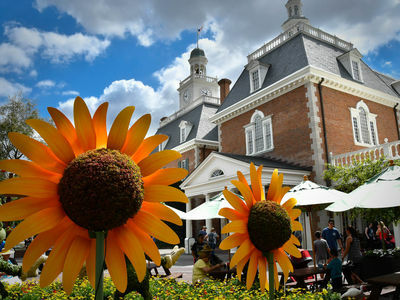 When you think about it, Epcot is always a joy to visit because of the over-the-top gardens, pristine flower beds, topiaries, and trees—and during the Flower & Garden Festival, it's almost indescribable. 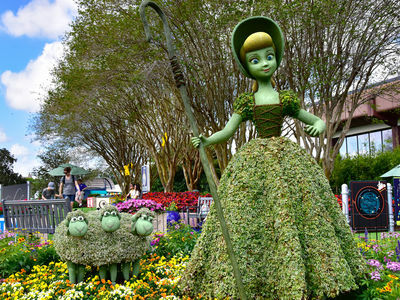 This year we were impressed with the Disney gardening cast. 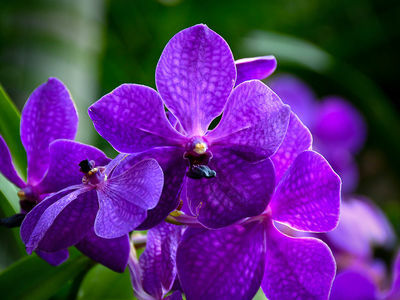 The International Festival of the Arts ended on February 25 but the Flower and Garden Festival began on March 6, leaving them with just nine days to get things ready. Certainly, they began a bit early where they could, but there is only so much that can get done while another important event like the art festival is still in progress. 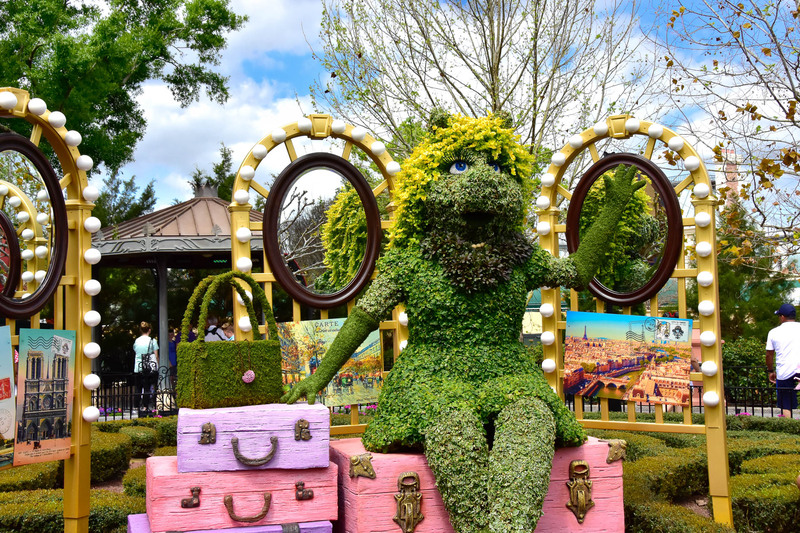 Last year we concentrated on the topiaries at the Flower and Garden Festival, and you can see some of the images in our article from last year, Topiaries at the Epcot Flower & Garden Festival: A Photo Tour. While the topiaries tend to change locations, most of them are here from one year to the next. This year we took a more general interest as we wandered around Epcot. We found some interesting flowers, some new topiaries, and some very interesting food. There are new designs in the flower beds between Showcase Plaza and World Showcase, but there's always a Mickey somewhere in the layout. Photo by Bonnie Fink. 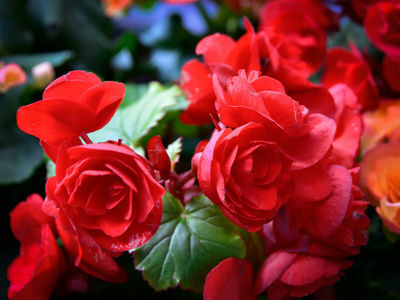 Of the more than 30 million blooms at each festival, these ordinary begonias in Future World East near Electric Umbrella are still worth a minute to stop and appreciate. Photo by Bonnie Fink. These yellow daisies are used in many of the beds around Epcot for this year's International Flower and Garden Festival. They certainly brighten things up and provide nectar for the foraging insects. Photo by Donald Fink. There's a rain forest display located just to the right of the pyramid in Mexico. It's a small area that's loaded with many different tropical flowering plants like these orchids. Photo by Donald Fink. One of the hidden gems at Epcot is the tropical rain forest located to the right of the pyramid as you face it in the Mexico pavilion. Photo by Donald Fink. These roses along the walkway between Future World West and Showcase Plaza are not wild, but it's fun to pretend they are. 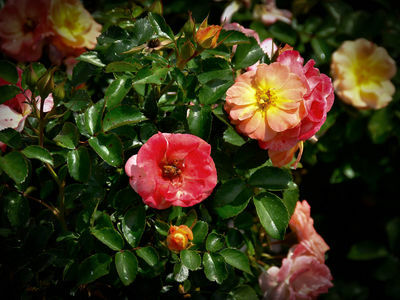 They're about the same size as the wild roses we've seen in the forests high up in the Rockies, especially in British Columbia. Photo by Donald Fink. The wildlife aren't planned as part of the Flower and Garden show, but this limpkin, or crying bird is here to enjoy it. 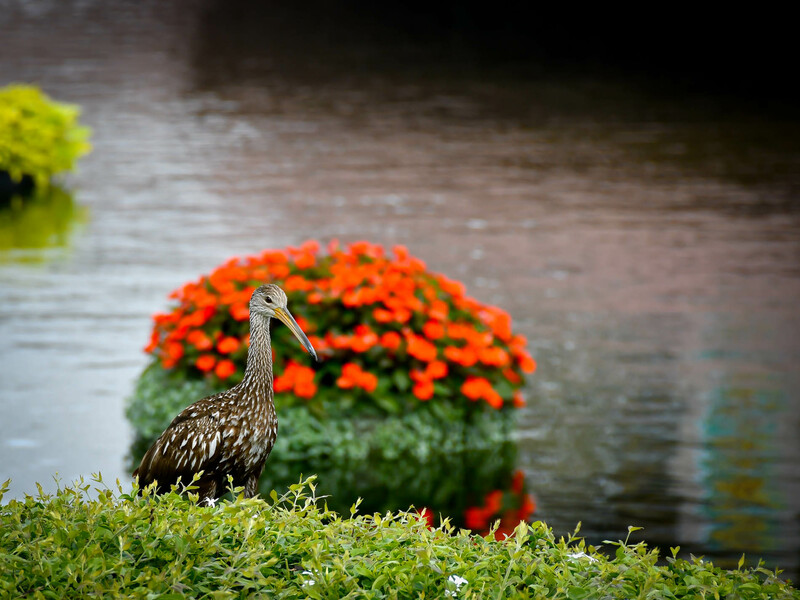 It's just one of the many birds found in the wetlands of Florida, who seem to make their home here at Walt Disney world too. Photo by Donald Fink. Little Bo Peep and some of her flock are new this year, next to the latest play area, Bo Peep's Playtime Training Grounds, in Future World East behind Mouse Gear. The playground is presented by "Toy Story 4," opening in theaters June 21. Photo by Bonnie Fink. 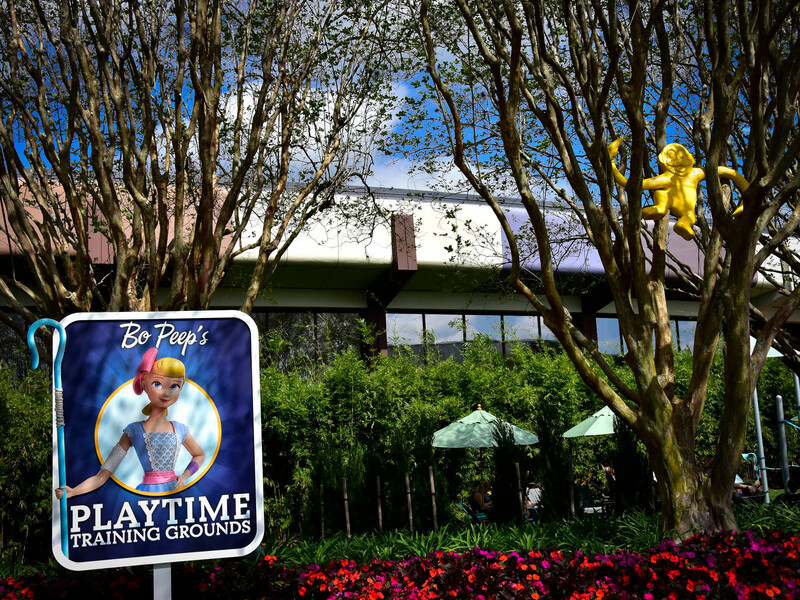 Bo Peep's Playtime Training Grounds is a new theme for the playground that's usually located behind Mouse Gear, near the purple martin houses. You can see a monkey in the tree to the right, no doubt from the barrel of monkeys in the Toy Story films. Photo by Bonnie Fink. This rocket is located in Bo Peep's Playtime Training Grounds. No doubt Buzz Lightyear had some influence in what was included as training equipment. Photo by Bonnie Fink. 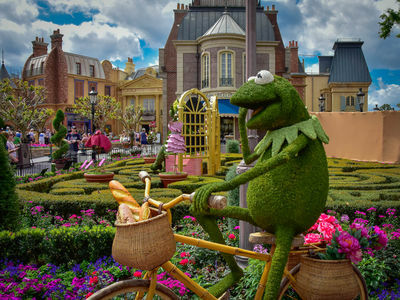 Miss Piggy is in France. Photo by Bonnie Fink. 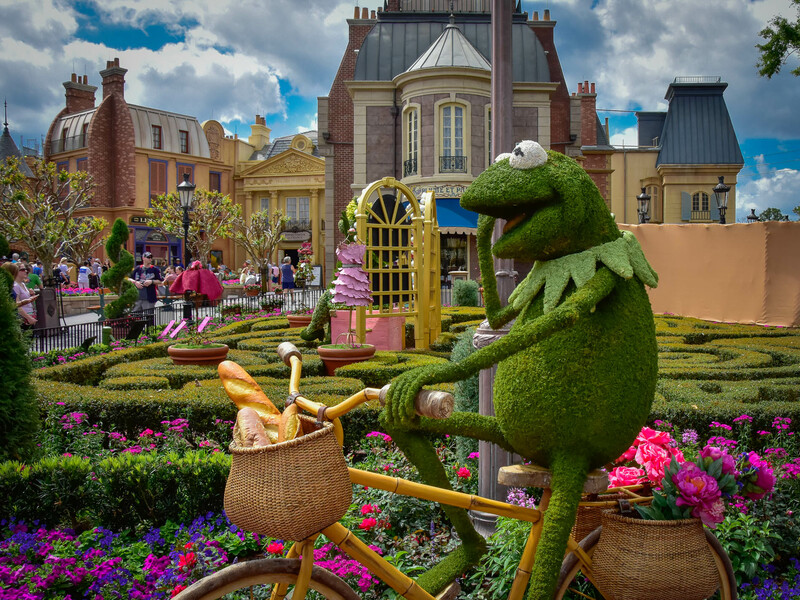 Kermit the Frog rides his bicycle through France. It looks like he's been shopping, with fresh bread in his basket. Photo by Bonnie Fink. 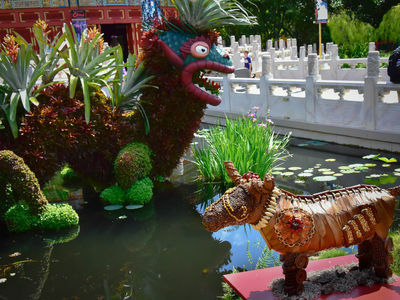 The bromeliad dragon is back in China this year. 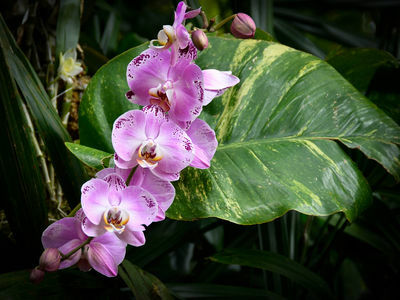 The term bromeliad refers to the type of plant that's used in the topiary. Something else that's interesting this year in China is that the animals of the Chinese Zodiac are displayed around the pond. Here, in the foreground, you can see the ox. We're not sure if these statues are considered to be topiaries, but they're made from all-natural items, such as bark, seeds, and stalks. Photo by Bonnie Fink. The new sunflower topiaries are in the American Adventure Pavilion. Photo by Donald Fink. This penguin and chick, in Future World West near The Land, are sculpted from ordinary plastic trash that was improperly discarded. 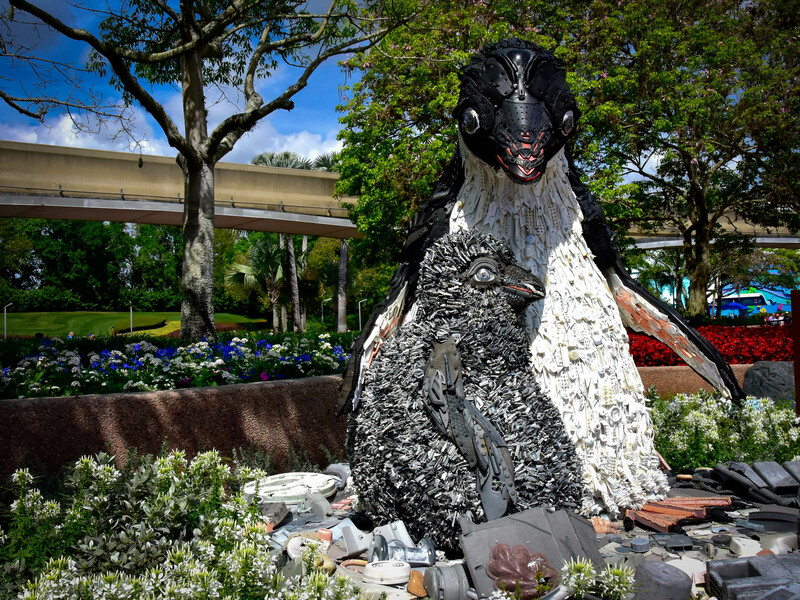 This piece of urban art promotes awareness of the problems with trash—especially single use plastic in our oceans. Photo by Bonnie Fink. 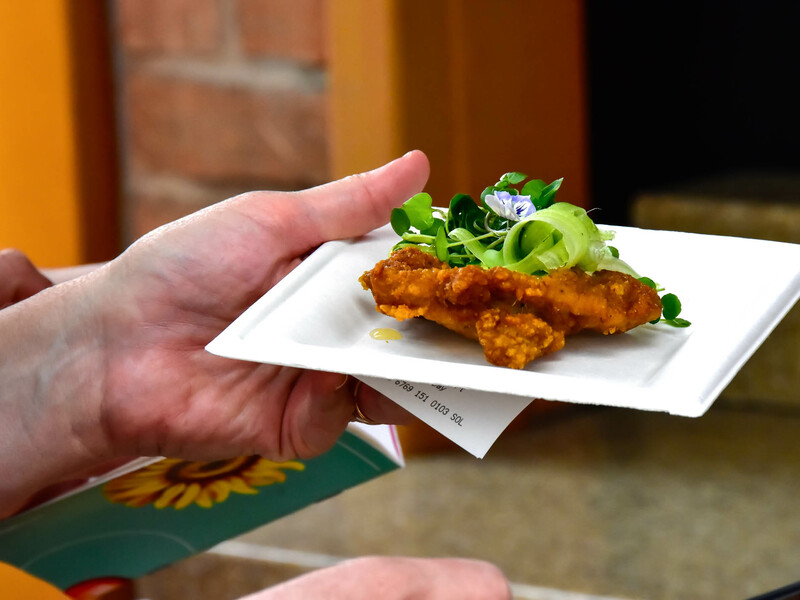 Crispy citrus chicken is available from the Citrus Blossom Outdoor Kitchen, which is new this year and located in Showcase Plaza, toward Canada. Photo by Bonnie Fink. The Trowel and Trellis is a new Outdoor Kitchen this year, and is located in Showcase Plaza, toward Mexico. The kitchen is sponsored by IMPOSSIBLE Foods, from Redwood City in California. All of the items offered at this location are vegetarian. 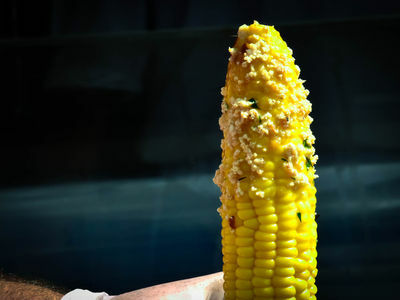 Grilled street corn on the cob, with savory garlic spread is available at Trowel and Trellis. Photo by Bonnie Fink. Another favorite from the Trowel and Trellis is the farmhouse meatball. 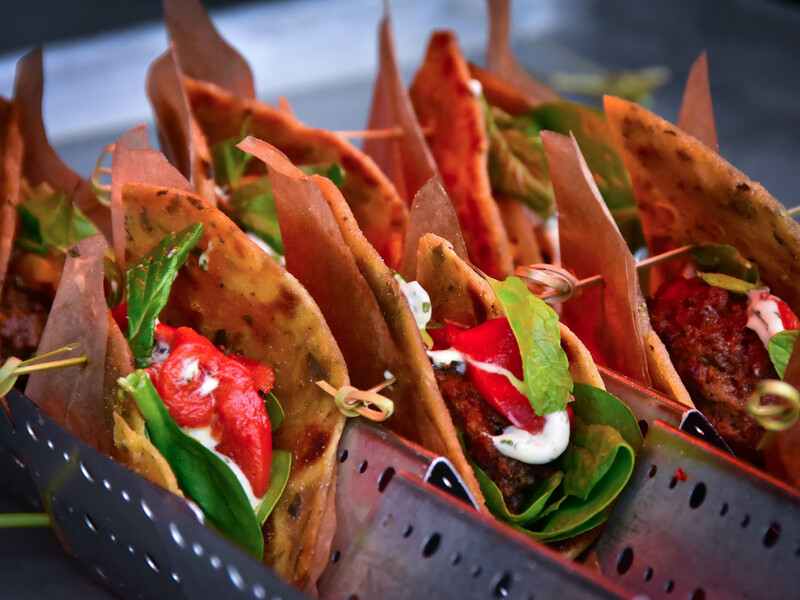 This item looks like a taco, but uses a lentil bread shell, with spinach, marinated vegetables, and a creamy herb dressing. Photo by Bonnie Fink. IMPOSSIBLE Foods is an interesting company. They make plant-based meats, which means that they create hamburger from plants that, according to their web site, tastes and cooks like actual meat. This is a big idea and has been a while in the making, with a large amount of research and experimenting. It seems to have promise. 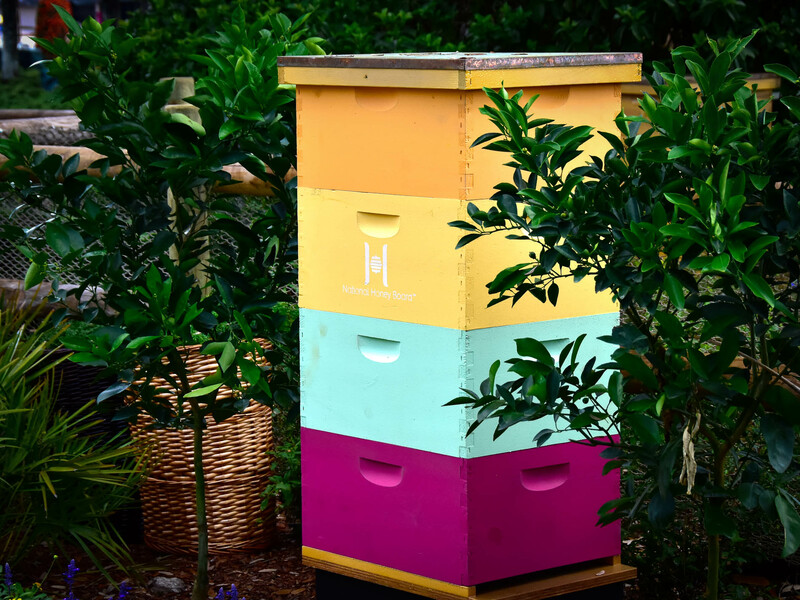 You guessed it, there is a honey-based menu at the Honey Bee-Stro, which is located in Showcase Plaza on the Walkway to Future World West. 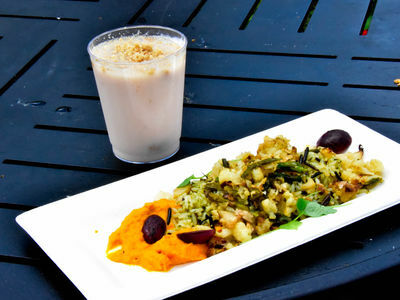 Roasted cauliflower with honey carrot puree, honey-blistered grapes, and wild rice pilaf is available from the Honey Bee-Stro. In the background is a honey-peach cobbler freeze with blueberry vodka. Photo by Bonnie Fink. 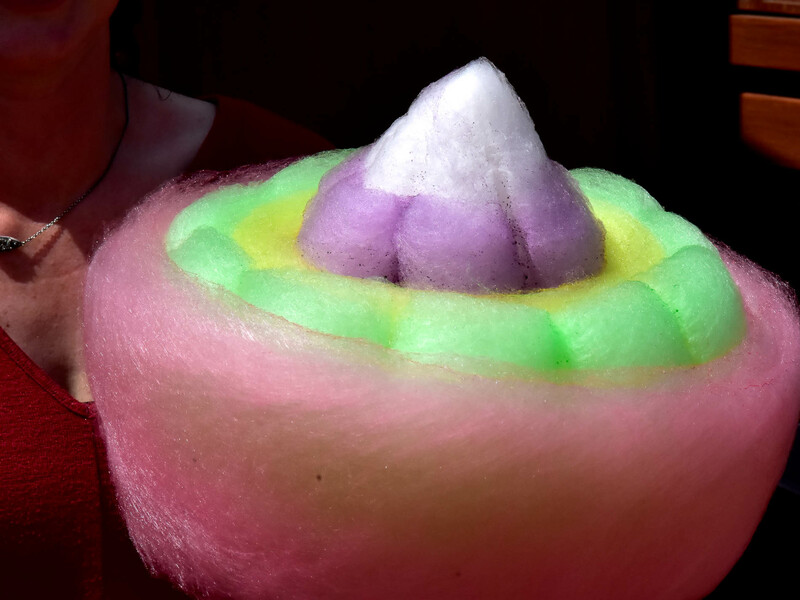 One of the more fun discoveries of this year's Flower and Garden Festival has been the Five Layer Spring Fantasy Cotton Candy. You can get one of these artful edibles at the Lotus House, located in China. For us, the fun was watching the artist create this mountain of sugar. Photo by Bonnie Fink. 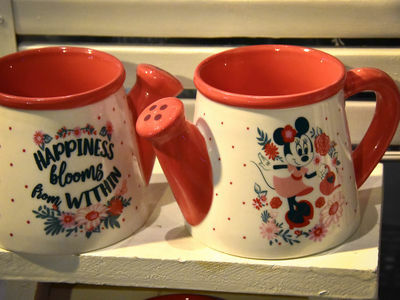 These coffee mugs, or just mugs in general if you're not interested in coffee are found in many of the markets around Epcot. They look exactly like small watering pails, which fit the theme of the Flower & Garden Festival, and it takes a closer look to tell that the holes in the spout are only painted. Good to know before raising a mug of hot drink to your lips. Photo by Bonnie Fink. A mug specifically commemorating the 2019 Epcot International Flower & Garden Festival is also available, in case you want something for your collection that reminds you of this particular year. Photo by Bonnie Fink. We tried to grow topiaries one time when we lived in the San Joaquin Valley in central California. It didn't go well for us. This year at the Flower & Garden Festival, there's a vendor called Noah's Ark Topiaries, from near Tampa. 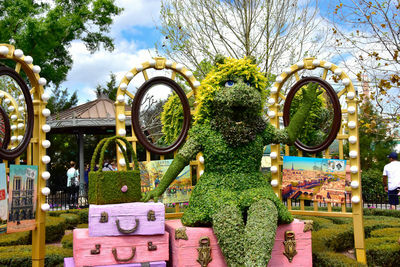 They have wired topiaries of various sizes and shapes with or without the moss already attached to help get you started. Some topiaries, like these above, have ivy already started. Photo by Bonnie Fink. Noah's Ark Topiary has been selling topiaries at Epcot during the Flower & Garden Festival for as long as there has been a festival, according to the company's owner. Before that, there was an assortment offered at the American Adventure pavilion. 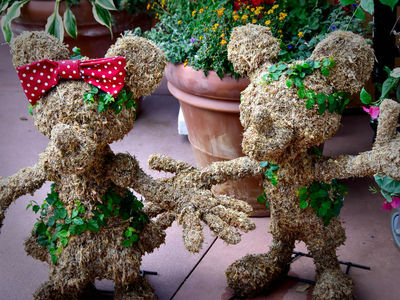 You can see demonstrations of how these topiaries are made by visiting their booth on Thursdays, March 28, April 4 and 19, and on May 9, from 11:00 a.m. through 2:00 p.m.
An interesting and fun garden near the Honey Bee-Stro Outdoor Kitchen, presented by Advent Health, informs about the usefulness of phytonutrients and the need to put color on your plate in the form of a variety of vegetables. Photo by Bonnie Fink. 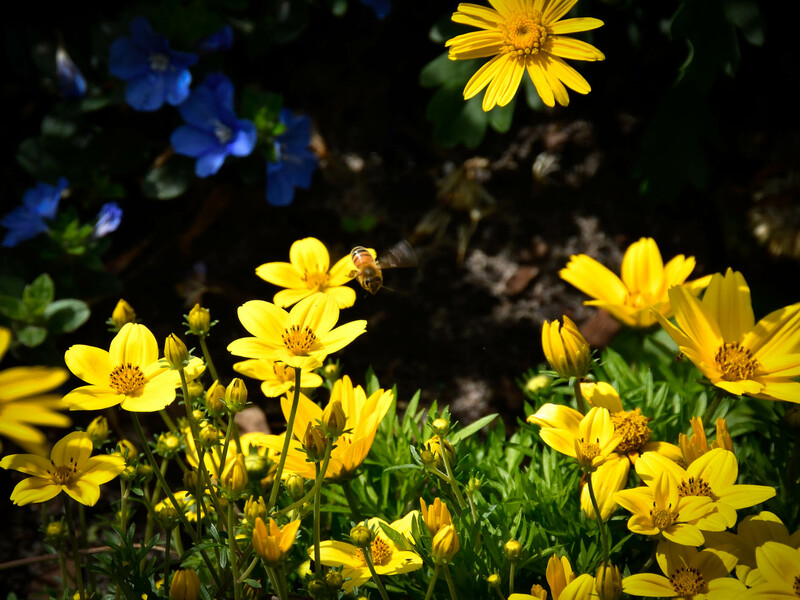 Near the Honey Bee-Stro you can find several informational displays describing the importance of bees in our food chain. This commercial hive is not populated, but appears to be the real deal. Many actual hives are even painted in bright colors like this one to help the keepers identify their hives and also to reflect heat to help keep the bees comfortable. Photo by Bonnie Fink. There are two scavenger hunts this year. Spike's Pollen Nation Exploration runs the entire length of the festival, and Egg-Stravaganza and Scavenger Hunt runs from April 5 until April 21. You can purchase a map and stickers for Spike's Pollen Nation Exploration at Odyssey Center, Mouse Gear, Disney Traders, Port of Entry, Pin Central, World Traveler, and many of the Festival Markets. As you make your way around the park, locate Spike and the nearby plant sign that matches a sticker to place on your map for that location. When you complete the hunt, return your map for a "special surprise." 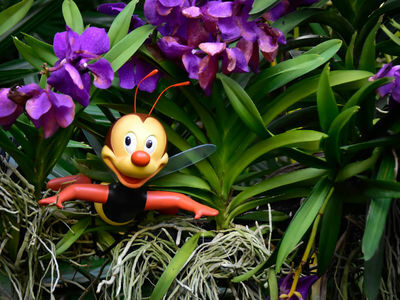 Spike is the host of Spike's Pollen Nation Exploration, a scavenger hunt that'll keep the kids (or anyone else) busy as you make your way around Epcot. Photo by Bonnie Fink. 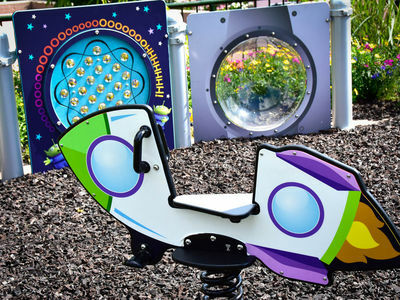 Egg-Stravaganza Scavenger Hunt works in a similar way, but its area is World Showcase rather than the whole park. You can learn more about these fun activities and more for the kids at their web site, here. 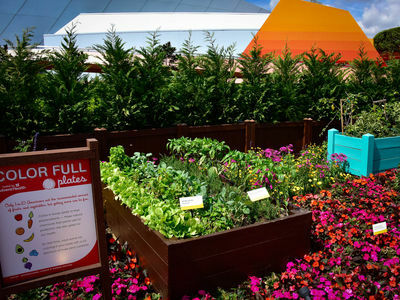 Now that we've finished with our photo tour and pushed the "Submit" button at MousePlanet.com, we plan to visit Epcot several more times during the course of the Flower & Garden Festival. It's nearly impossible to take it all in with one or two visits, or possibly even from one year to the next. It's worth it to us in terms of pure entertainment to keep going back to see what we can find. 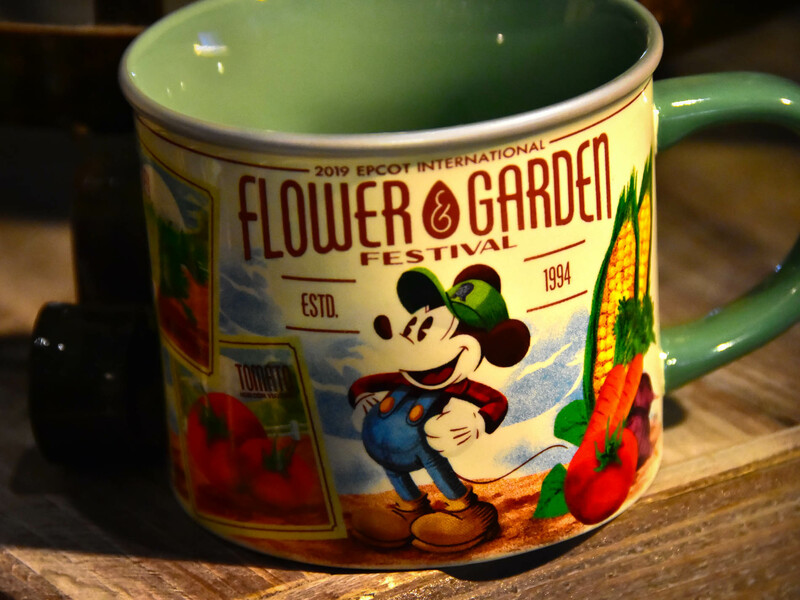 As we made our way around Epcot taking pictures for this photo tour, we managed to find a few clips that we think capture the spirit of this year's International Flower & Garden Festival. Take a look. Video by Don and Bonnie Fink.